Enterprise Rent-A-Car has announced that when the Chevrolet Volt, Nissan Leaf and Coda Electric Sedan begin arriving at their branches later this year, renters who return the vehicle without a full charge will not be hit with addition fees similar to those for returning a gas-powered car with a half-full tank. If you have rented a car in the last 5 years, there is a good chance that you are familiar with the hefty charges applied to your credit card if you return your rental without the proper amount of gasoline. Enterprise, for instance, expects you to return the car with the same level as when you take it and while it might not always be convenient, it isn’t very hard to stop and top off the tank. However, electric vehicles take as long as 8 hours to charge on a high speed charger and if you are renting an electric vehicle, what are the odds that you will have one of these 240V chargers? If you are left plugging a Chevrolet Volt into your typical wall socket it is going to take you quite a bit of time to return the battery to full and if you are renting a car for a couple days; do you really want to spend 20 hours waiting for the battery to recharge? Luckily, Engadget is reporting that Enterprise will have charging stations for their electric cars so should the rental not be fully charged, there will be no additional fee. There is no word on whether or not other rental companies featuring electric vehicles will adopt the same policy but without a similar plan in place, the electric vehicles could be very unpopular to those without some access to a 240V charger. Even with this incentive, I am interested to see how popular full electric cars like the Nissan Leaf and Coda Sedan will be as most of the people I know who rent cars, typically put lots of miles on them and without a high voltage charging station, recharge times are going to be brutal. 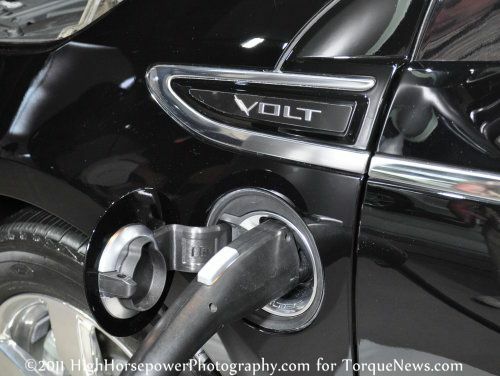 The Chevy Volt, on the other hand, could provide for an enticing option for someone who is driving from one city to another, who will be able to access public charging stations when in the city while relying on the range-extending gasoline engine to help make the long portion of the trip.